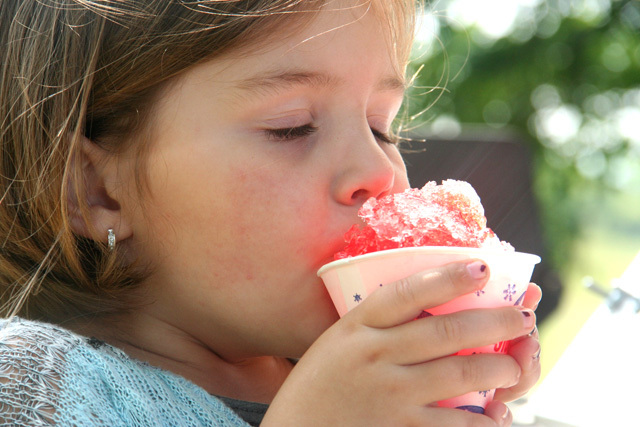 Snow cones bring very dear memories of my childhood in Venezuela... 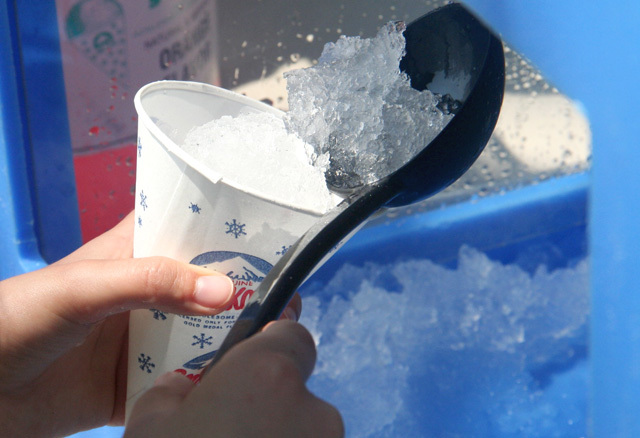 The syrupy concoction, served in a paper cup, was always the right treat after running around like maniacs at the park, under the sun of Caracas' warm afternoons. I still remember perfectly that corner, in which all of us, the kids from my neighborhood, would line up in front of a very old fashion cart with a happy hot dog painted on it. We would wait there, standing patiently to be rewarded with a hot dog and a snow cone or "raspaito" topped with sweet condensed milk, the two wonderful creations of this angelical, Italian man, who owned the cart, and served everyone with a smile, everyday, for many years. It was something simple, something cool to look at, a cart with an antique ice shaver vigorously shredding one rock of ice after another, and hot dog buns coming out of a mysterious, steamy drawer. It was just a quick bite on the way home, something to calm us down before dinner, but the happy atmosphere around, the unique flavors, and the satisfaction of the broken ice freezing my mouth and the tip of my nose, still remain fresh in my mind. 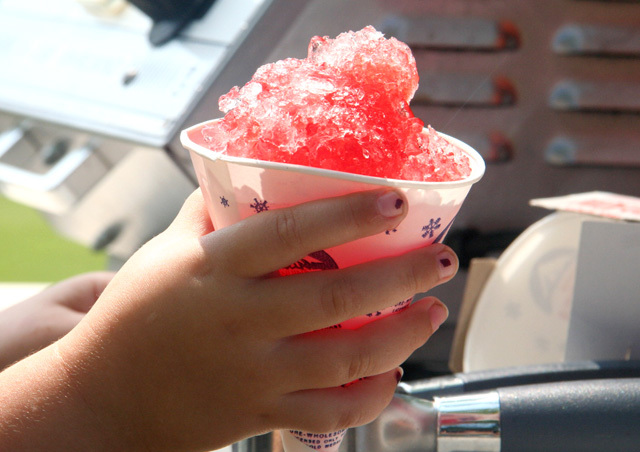 It will be very hot in New York this weekend and we are already thinking of snow cones, lemonade, and spending time by the water... 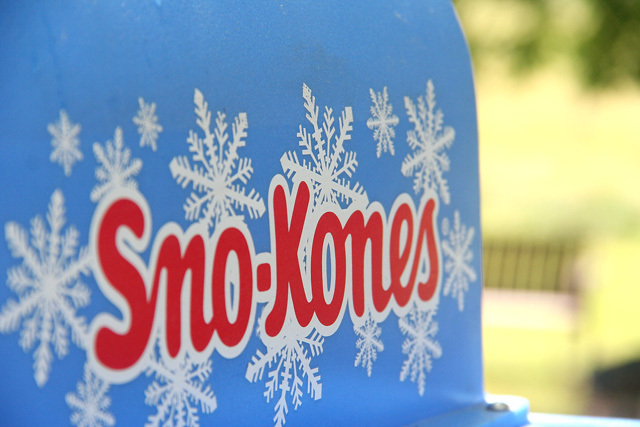 Wherever you go, have a great weekend, look for snow cones and stay cool!! Oh Joy! for Winter Water Factory: Baby Girl Clothes Incredibly Cute!! Oh Joy! is one of my favorite blogs, one of those eye-candy journals that gets me excited every time I see there is a new post on it. Design, fashion, and food are the inspiration of Joy Deangdeelert Cho, the graphic designer behind this impecably curated blog. A few months ago, Joy had her first baby and definitely, motherhood has brought her another source of inspiration. Here and there, Joy posts about Ruby, her precious bundle of "joy"; some times about life with Ruby, some others about Ruby's cool fashion, and recently, about these gorgeous, little outfits. Oh Joy! for Winter Water Factory collection available here. ...Do you feel like visiting Joy's blog? Click here. Lifestyle pictures by Bonnie Tsang, courtesy of Oh Joy! Finally, the school year is over... yaaay!! Behind is all of that heavy schedule piled with recitals and end of school celebrations. It is time to relax, plan a vacation or two, schedule a few day trips, and get ready to go, because before you know, it will be fall again. Now that my girls are nine and six years old, I'm really enjoying day trips with them. 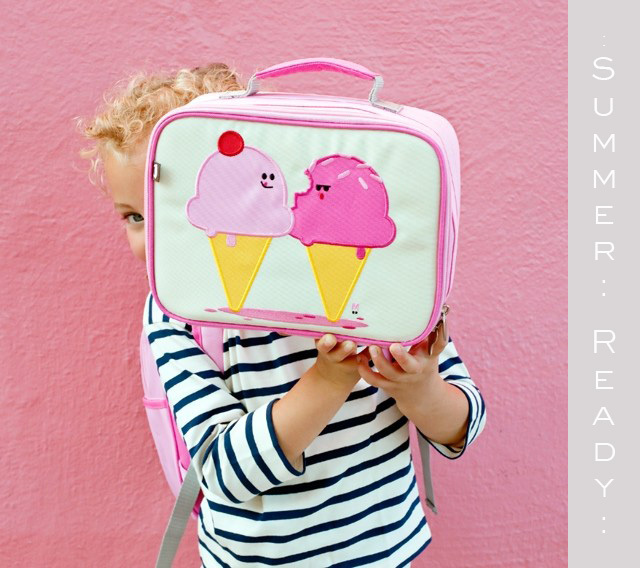 Diaper bags, diaper changes, constant feedings, those are things from the past... However, more flexibility doesn't mean total liberation. I still have to prepare well for a full day out. My most important isssue to avoid whining and sudden cravings, is to arm my girls with small backpacks, something light that they can carry all day, roomy enough to hold all of their necessities. A bottle of water, snacks, a book, a pencil, crayons, a few sheets of paper, tissues, and their Ipods or any educational device... It really works!! Think, peace of mind, you won't have to search, every minute, for their things in your own bag, and they will be able to provide themselves with what they want, without asking. "Dolce and Panna" ...sweet and cream. It sounds like the tale of two ice cream scoops enduring the heat in the summer, fighting against total melting... So adorable!! 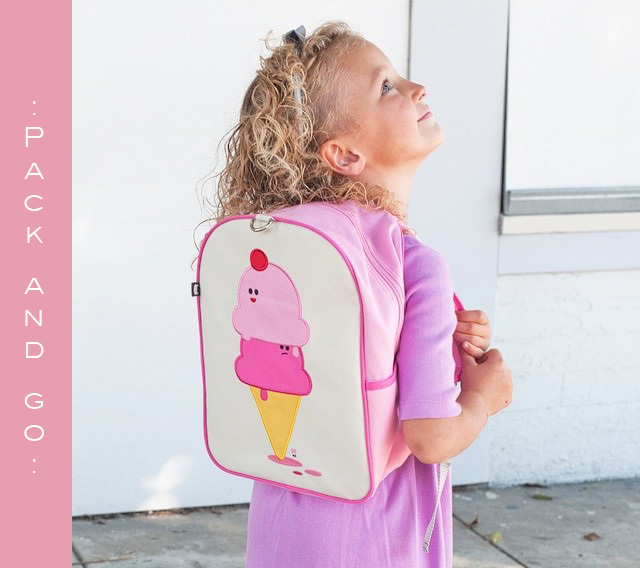 I am loving this design with its delicate colors and summer theme, but I especially like the fact that all of Beatrix NY's backpacks and lunchboxes are PVC free, lead free and phthalate free... What are you waiting for?? Get summer ready, pack and go!! Beatrix NY, full collection available here.